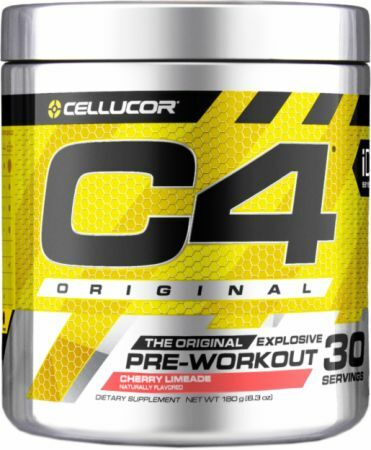 C4 Pre-Workout for Energy & Focus During Exercise! Explosive energy, heightened focus and an overwhelming urge to tackle any challenge...that’s the C4 experience. * Millions of people—ranging from beginners all the way up to the elite competitors, have relied on C4 to help them turn their ambitions into achievements. 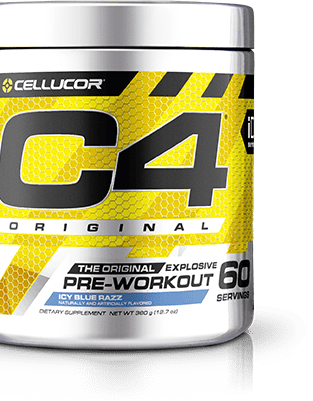 As America’s #1 selling pre-workout, C4 Original lives up to its solid reputation with a classic formula for advanced energy, endurance, focus and pumps! * But with a new bottle design and more delicious flavor options for you to choose from, you’ll feel like it’s your very first time experiencing the C4 you know and love. **Includes all C4 products over product line lifetime. I've tried a handful of flavors of this product. Makes my face and fingers tingly, which i dont mind. 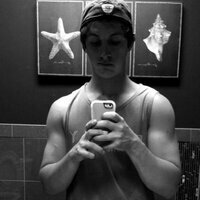 The feeling goes away after you start working out. The energy it provides last through my workout after a long day of work. I've had experiences where I opened and mixed a new container and the mix is gritty as I drink it. If you purchase this product, make sure you purchase a light color. The blue raspberry is extremely dark, dyes my mouth and lips, and dare I say it...my number 2's are also green and blue. Please use less dye!! I have been drinking this stuff for at least the last 5 years. I like it. It tastes good. Works good. Not sure if this can continue. I can kinda see they are adjusting the formula a bit. Lately they seem to be doing better on the clumping, so that’s good. I like the icy blue raz and the fruit punch. The only problem is that the amount of dye. This stuff is soooooo bright I mean they cranked the dye up to 11+. Please take some of the dye out – it does not need to be so intense. There is no reason to be drinking this much dye – I mean … dude - holy crap that’s a whole lotta dye. Just cut they dye back like 80-90% or so and the stuff will still be super bright. Seriously though, I loved the Pineapple flavor. I hope that comes back. It was really good and was not loaded with so much artificial color. If it isn't used regularly the powder will lump up and make it impossible to scoop out. The Tart Candy Explosion has a great taste and doesn't stain my lips when drinking it. 8/10 only because I need 2 scoops of Original to actually help. If this was offered in the extreme energy line I would use that. But the taste is so good it's hard to go away from it! Flavor is good, but not enough "punch". Product mixes well and tastes good. Helps me power through those 5am workouts. Plenty of energy, alertness, and drive without feeling jittery. Purchased Icy Blue Razz. When I mix it in water, I felt it has too much of blue color and it leaves my shaker stained with the blue color. Also after drinking my tongue is all blue which is too bad. Doesn't sound healthy at all considering too much color being put in this. Disappointed with C4 on making such a product with too much of color in it. Have used Fruit Punch flavor before and that was fine and not much color. Used this for years since I started working out. Moderate caffeine level and it kicks in 15mins or so. One of the best ways to wake up your body after a long day at work. Highly recommend (especially for beginners). Overall not a bad product. You don’t get edgy at all from using this product. But after a couple weeks I did notice that theeffects are not as long-lasting. Pretty good stuff for beginner level, after which you have to increase in dosage to about 2 to 3 scoops for eight ounces. Flavors are bad either, you don’t get that chalky taste. 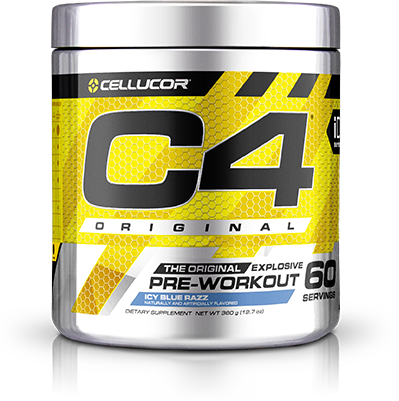 Directions For C4 Original: Take one serving (1 level scoop) of C4® Original, mixed with 6 fl. oz. of water, 20-30 minutes before training. Some individuals may experience a harmless tingling sensation, which is attributed to beta alanine. USE ONLY AS DIRECTED. Warnings: THIS PRODUCT IS ONLY INTENDED FOR HEALTHY ADULTS, 18 YEARS OF AGE OR OLDER. Do not use if pregnant, nursing, currently taking PDE5 inhibitors or nitrates for chest pain. Do not take this product before consulting a licensed, qualified, health care professional if you are taking any other dietary supplement, prescription drug or over-the-counter medication; or if, you suspect you have or have been treated for, diagnosed with or have a family history of, any medical condition. This product contains caffeine and should not be used in combination with caffeine or stimulants from other sources. Discontinue use 2 weeks prior to surgery. Immediately discontinue use and contact a medical doctor if you experience any adverse reaction to this product. Do not use this product continuously for more than 8 weeks. Do not use if safety seal is broken or missing. Store in a cool, dry place. KEEP OUT OF REACH OF CHILDREN. This product is sold by weight, not volume. Some settling of powder may occur during shipping and handling, which may affect density of powder. This product contains the servings indicated when measured exactly by weight.